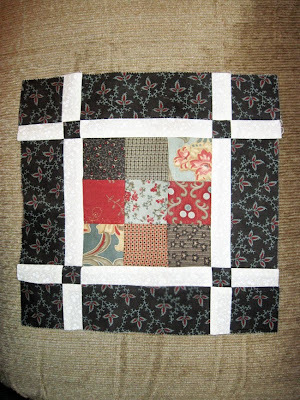 I think I have been quilting for about 5+ years now and I have avoided the Block of the Month programs and Jelly Rolls. However, I have changed my ways. I recently bought a bunch of Jelly rolls and was looking for ideas on how to use them. Along came Moose on the Porch Quilts - Jelly Roll Sampler Quilt Along 2010. Not only did I jump into a Block of the Month program but one that uses my Jelly Rolls. I like how this one does a new block every two weeks too! So, I am using Moda Hemming House Jelly Roll and here is my first block. It looks a little lopsided but it's on a curved cushion. This too is also my first quilt along. Did you post to the Flicker Group? Isn't it great to see all of the variations?